Taylor Howes and Davidson, two bastions of the artisan and design world in the UK, have revealed a stunning new dining table collaboration at FOCUS 2018. The table, named “The Howes Dining Table”, will be launched at a special event during the week and is the result of a 6-month collaborative process. This is the Davidson studio's first collaboration and a celebration of the pair’s 25-year friendship. It took six craftsman and designers from the respective studios some three months to develop the prototype, which is hand carved and has a striking figured Angere to the top. 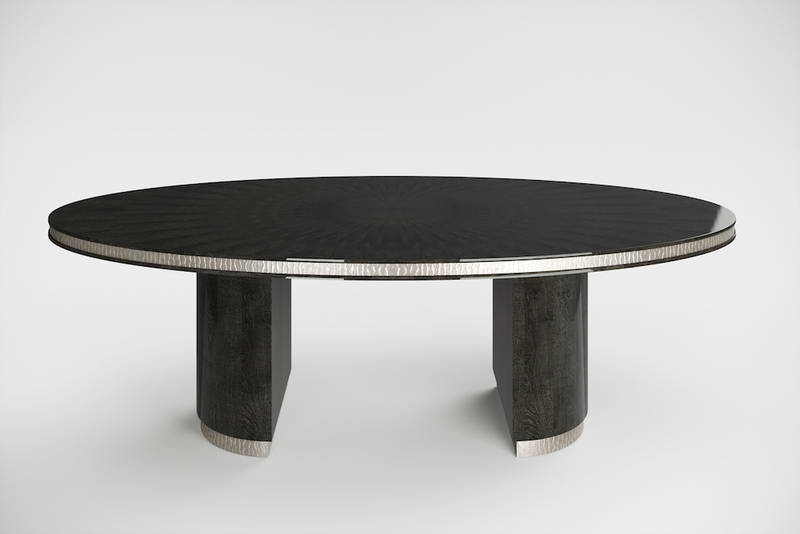 The table, which in homage to the philosophy of both firms is more akin to an art piece than something so functional as a table, boasts an eye-catching radial pattern on its surface and is a demonstration of the very best in British craftsmanship. The concept of the table was born out of the timeless nature of Davidson's existing pieces and the inherent nature of dining tables traversing decades, being passed on from generation to generation. Taylor Howes explored the nature of passing time and how this might be represented in the design, focusing their thoughts on a single day - from dawn to dusk. This image inspired the River bed relief, which is reflective of the image of sun hitting rippled water at sunrise and the soft evening tone as it sets at night. Working with Davidson it was decided that the shape of the table should be oval, as it continued the theme, with the continual loop, a never-ending passage of time. This was then followed through in the base, where the team created two semi-circular elements. The collaboration forms part of a wider initiative by the Taylor Howes studio and is part of its #52WeeksofTH campaign. A year-long celebration of the studio's 25th Birthday, which has seen something new happen, either announcement, collaboration, Q&A or event throughout the year. The collaboration with Davidson is one of the larger initiatives to happen in Taylor Howes' 25th year and its sits alongside the studio's own collection launch, which is to be revealed November 1st 2018 and the group's first Business of Design and Luxury summit, which is to take place on November 21st in the The Gladstone Library, One Whitehall Place, with guest speakers from the world of design and luxury internationally. Karen Howes, CEO & Founder of Taylor Howes, commented: “We are thrilled to be launching our collaboration during FOCUS. I have worked with Davidson for 25 years so it was fitting to work with them to create something truly unique and special for our 25th anniversary. Six months in the making, “The Howes Dining Table” is a statement piece and a signature of our design philosophy: elegant lines, exceptional craftsmanship and material imagination. 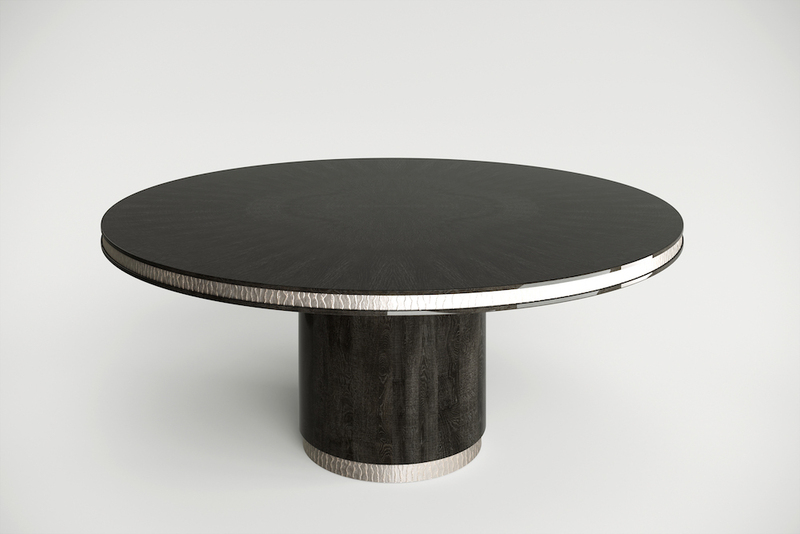 We're known in the studio for our finishes and detailing and “The Howes Dining Table” is no exception to this. Working with Davidson has been a great journey; we've loved every part of it, from the early consultations to the unveiling of the finished piece. The table is a true celebration and exemplar of British craftsmanship, conceived in our studio by our in-house designers, the skilled team at Davidson then brought it to life, it is part of our commitment to preserve and uphold British craftsmanship”.